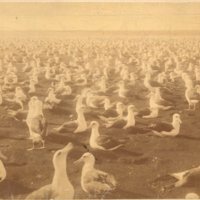 Photographs from a collection of albumin prints by James J. Williams (1853â€“1926) acquired by the Hawaiian Historical Society in May 2002. Williams was active as a photographer in Hawai'i from 1879 to 1926. He was one of many photographers who opened a studio or gallery in Honolulu. By 1890, approximately sixty photographers worked in the Islands, twenty in Honolulu. Wailuku, Maui, looking toward 'Iao Valley. No date. The queen's guard and barracks, Honolulu, 1892. 'Iolani Palace, Honolulu, early 1880s. Lava flow, Mauna Loa, Hawaii Island, 1881. Mahukona railroad and train, Hawaii Island, 1882. Our Lady of Peace Cathedral, Honolulu, late 1880s. Picnickers at the top of Nu'uanu Pali, O'ahu, late 1890s. Undated studio portrait of hula dancers.